Thanking donors shouldn’t be a process: it should be an experience. An experience that will last as long as someone donates to your organization, which hopefully will be for a long time. If you treat thanking your donors as a ho-hum task that you have to do, it will show. 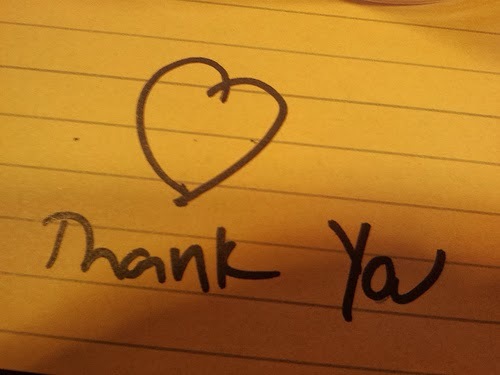 Thanking your online donors is a three-part experience (not process). Your landing page is your first chance to say thank you and often it’s no better than an online shopping receipt. Open with Thank you, Jim! or You’re amazing! Include an engaging photo and a short, easy to understand description of how the donation will help the people you serve. Put all the tax deductable information after your message or in the automatically generated thank you email. Next, set up an automatic email to go out after someone donates online. This will let your donor know that you received her donation and it didn’t get lost in cyberspace. I’m a firm believer that even if someone donates online, he should receive a thank you card, letter, or phone call within 48 hours. I make most of my donations online, and in 2014 about 1/2 of the organizations didn’t send me a letter, just an automatically generated email. None of them called or sent a handwritten card. Make your donor’s day with a handwritten thank you card or phone call. You don’t have to do this alone. Recruit board members, other staff, and volunteers to write cards or make phone calls. If that’s not possible, write an amazing letter and include a personalized handwritten note. I understand larger organizations may not be able to send all their donors a handwritten card, but they should have the resources to create a decent letter. Most thank you letters are pretty mediocre. Create something that stands outs. Be personal and conversational without using any vague jargon. Recognize past gifts or upgrades, and give a specific example of how the donation will make a difference. Something like this. You’re incredible! Thanks to your generous donation of $75 , we can provide a family with a week’s worth of groceries. Approximately 70% of first-time donors don’t give a second gift. Don’t let that happen. A week or so after you thank your new donor,send her a welcome package. The thank you card/letter you send after you receive a donation is not the end, it’s the beginning. Find ways to thank your donors throughout the year. Thank them at least once a month. A thank you plan can help you with that. Create a memorable thank you experience for your donors. ← What Makes a Great Donor Newsletter? Great stuff Ann! I think if more nonprofits would focus on giving their donors a great experience and help them feel good about their decision to give, they would see an increase in their fundraising. Thank you so much Sandy! Nonprofits need to do a much better job of thanking their donors. Great read Ann! Theres a lot of valuable information in this post that I don’t think people take enough advantage of, especially handwritten cards. A good thank you experience can lead donors to potentially donate again and leaves a good impression of your organization. With that said, Thankster.com is a useful tool if you want to send out cards to donors to thank them. Might want to check it out to save time writing cards!